Since it's so cold out, I have really enjoyed being couped up in my scrapbook room, hoping to get caught up on some things... My mind works faster than my hands can and makes a LOT of plans that take time to get to paper! 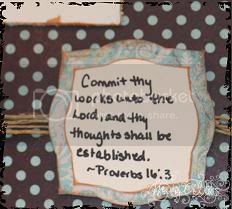 First today is for Scripture Saturday here and over at Christian Paper Crafts. Today's verse is Proverbs 16:3. I chose to use Gloria's Sketch #40 over at Christian Paper Crafts to fix a page for my husband's scrapbook. Shhh...it's a secret, and I am hoping to take pictures as he is preaching to give to him for Christmas this year! I think I need to get to work on it more and what better way than using the wonderful sketches and Scripture Saturdays as motivation!! Oh, and Cindy's challenge for Fun on Friday yesterday was to use your nestabilities to emboss with! I really did it...finally... Although the picture doesn't do it justice, I was so tickled with the result of the embossing, it really gave it an added touch!! 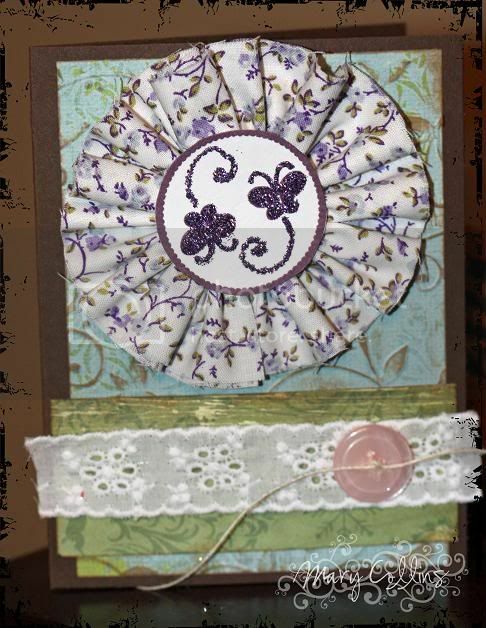 On to CASE Artist Saturday over at Christian Paper Crafts, where our featured artist today is Deedee. 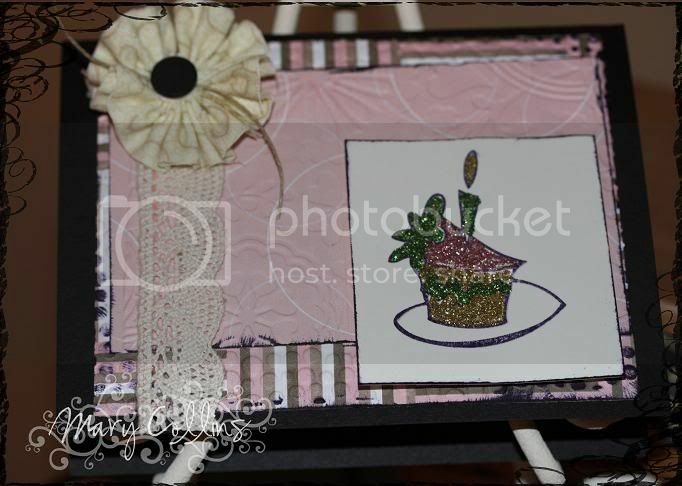 Click here to see the card in her gallery that I chose to CASE the basic layout of, and below is my interpretation and creation! I hadn't made a clear card in quiet some time and I added a layer with the silloute stamped image! Today I am very happy! Up very early, after going to be very late, snow in the forecast (I strongly dislike snow)...but still VERY happy! You see, this week I had what I consider to be a WONDERFUL apt at my hematologist! Cleared for another 6 mos and I am praising God! This little number today follows three challenges! First - albeit very basic, is the square you see! 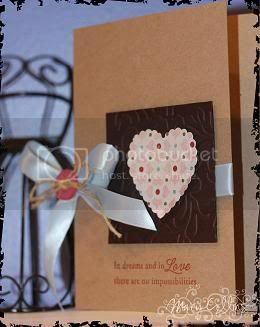 Cindy's challenge over at Christian Paper Crafts today for Fun on Friday is all about die cutting machines. I really wanted to play along, but this card simply needed a square! I guess that goes to show you that even the simplest of functions can be done on the good ole' Cricut! Next is the ribbon! 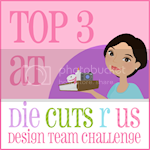 When I saw that the challenge over at Die Cuts R Us this week was to use ribbon, that had me hooked! With a little button and some jute - well, that's right up my ally (and yes, it was hard for me to NOT add lace in there somewhere!)! Lastly, this wonderful sketch is from none other than 2Sketches4You! 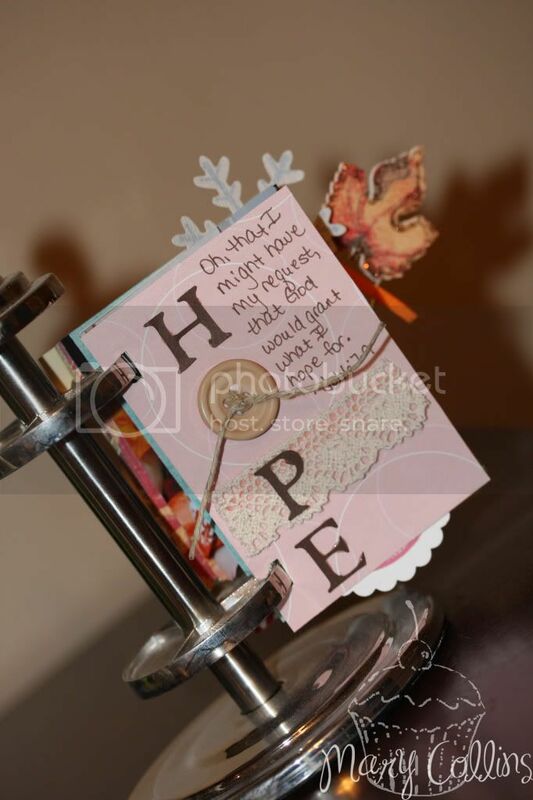 The cardstock is Gina K, and the patterened paper is from the Blush line by Basic Grey. Wal-Mart is responsible for the silk ribbon, button and sentiment (Heart Prints Sentiments) are from PaperTrey Ink! Oh, and I used the Victoria folder to emboss my square on my cuttlebug! Just since it's Friday, here is a little sneak peak at something special I am working on for Valentine's Day! I'll tell you more about this project NEXT Friday - which give you plenty of time to try it for Valentine's, too! The month of January is quickly coming to an end, but we have had so much fun playing with GinaK goodies at Christian Paper Crafts. When it comes to Valentine's this year - why not think of someone other than your normal sweetheart? My favorite scrapbooking buddy is my mom - and what scrapbooker wouldn't think this kind of candy is not better than chocolate? 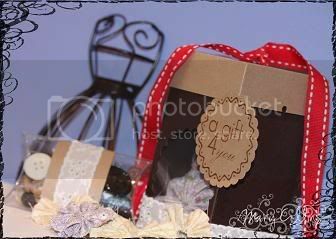 The box is a timeless template purchased at PaperTreyInk and the stamp is Gina K from the Festive Labels collection. 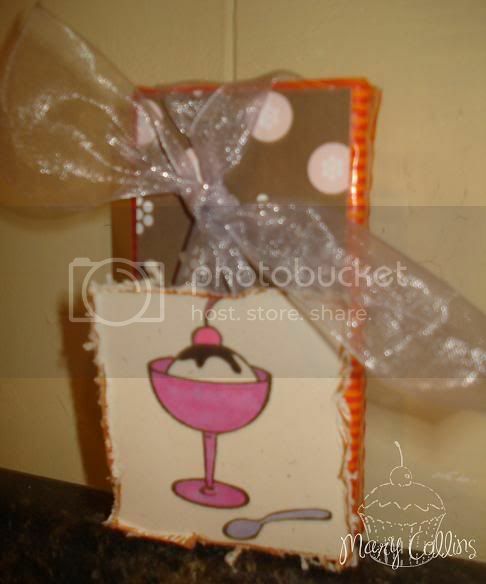 The small pillow box of buttons is also from Gina K and can together with scrap paper to make a small gift. 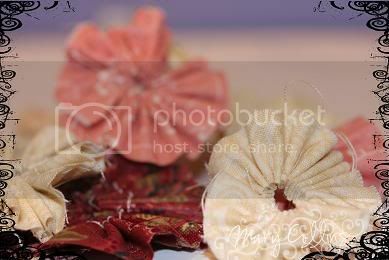 All the fabric flowers are handmade by me. Well, I must run - it will be a long day at work with an evening meeting and snow on the way tomorrow! I'm happy to say that next week I hope to have my new blog more up and running and be more recovered from the battery issue :o)! Good Monday morning! Along with Monday and back to work, comes a little bit of fun in that it is Color Monday with Jen over at Christian Paper Crafts. Today's challenge was to use teal, kraft, white, and one other color of your choice if you wish! Let me tell you, Jen has really been on a teal kick this month! I am starting to think that it's her new favorite color or something :o) That's okay though - I am in a pink mood as you can see with the pink and snowflakes that I have added in! We're supposed to have some more snow coming our way this week, and that makes me oh so sad. I am really ready to see the snow end for the year. Thankfully I had tires placed on my little car Saturday, followed by the most wonderful day with my mommy and little girl. Those are the most precious times - ever. I can't wait to see what you make with Jen's color combo! I am so excited to be back on here! My computer battery totally wiped out earlier this week - so bad the computer would not even work with the power supply - it was almost a nightmare with school, but alas - as always, God is good and we made it through! And now, we have a new battery! 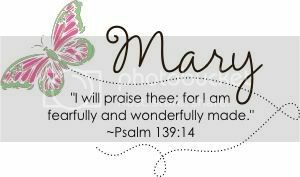 I am so thrilled that you have joined me here on my blog for Scripture Saturday! Today, I would like you to take a look at Psalm 119:103. I thought the wonderful use of the word "sweet" is a perfect compliment to the "How Sweet It Is" stamp set by Gina K that the Christian Paper Crafts Design Team has been working with this month. 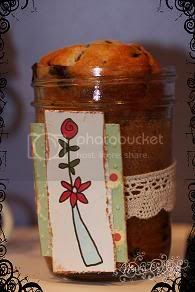 To go along with the card, I also made a little loaf of blueberry bread in a mason jar - yummy yummy! Also, I am just getting to upload my card for Die Cuts R Us this week since we have had computer woes! Good morning! Welcome to my blog! If it's your first time visiting, I hope you'll browse around and come back soon! Gina K is our spectacular sponser over at Christian Paper Crafts this month and this is the lovely little card I made with her super sweet set "How Sweet It is"
This card also uses black cardstock from Gina's store, as well as some free digi paper from there and some of the wonderful buttons she carries! Have a wonderfully blessed day. Oh, and on Saturday, I have a super "sweet" treat for you with Gina K and Scripture Saturday - all right here on my blog! As I continue to work on my ATC stand for Scripture and Inspiration, I decided to use today's Scripture Saturday verse for a card! Psalm 25:4 is so insightful, in that we should all want the Lord to teach us His ways, rather than going by our own worldly ways. It is also CASE artist Saturday over at Christian Paper Crafts, and the sweet JulliaM is our artist to CASE today! Come on over and join us for any of the challenges and chime in on the fellowship as well! With all of the snow that we have encountered lately, this is now my favorite kind of snow flake - FAUX and glittery! :o) Hopefully the cold, cold weather will be giving us a little break this weekend and we will see some weather in the upper 40's! Talk about a heat wave for us! This little card is a couple of challenges rolled into one! The Jen's Color Monday over at CPC was to use Blue, Brown, and White... brrr - when those colors are together, to me they just begged for some snow flake action! And see the blue paper on there - that is some My Mind's Eye that I had leftover from Christmas projects! If you look real close, you can see that I also embossed it with a cuttlebug snowflake folder. 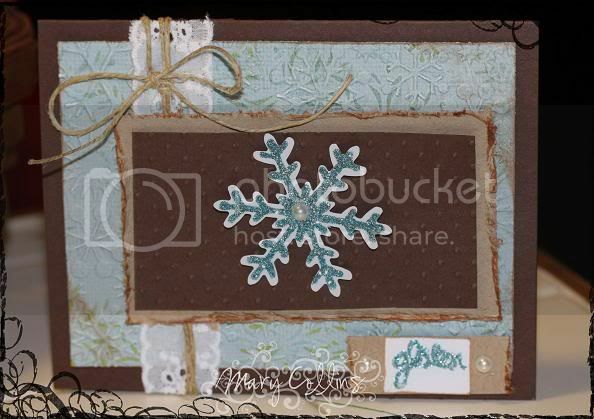 And of course, you know I had to add in some jute and lace to go with that pearl in the center of the snowflake! I hope that you are having a wonderfully blessed day! Die Cuts R Us is having a DT call! Be sure to check it out - they are wonderful and any girl chosen there is sure to have a wonderfully blessed time! Good COLD morning!! I am sitting here all bundled up on the couch and hope that you are warm, happy, and safe where you are as well! I've started the morning off with a wonderful work-out on the Wii and cleaned the house a little as well... We as so blessed to have our happy little home and be safe and sound today. 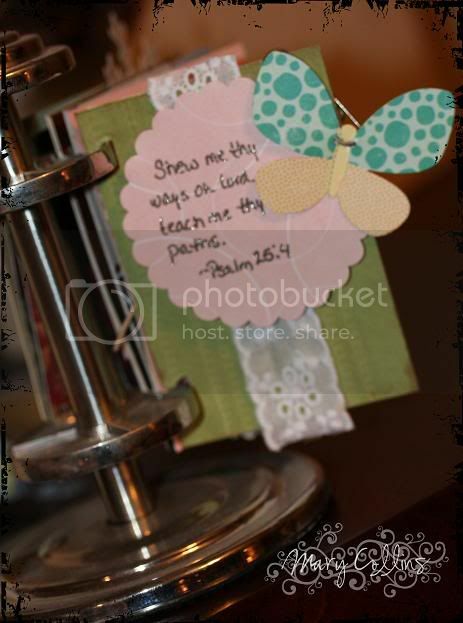 This little tid-bit that I have to share today is from a project that I have long wanted to work on, but never seem to find the time to do so... an ATC holder for my desk at work, full of Bible verses and inspiration... When I saw the HOPE challenge over at SCS as well as the Scripture Saturday challenge (yes, it is back after all this time) here and at Christain Paper Crafts - I just had to combine them with some wonderful Gina K FREE digi paper and buttons to make this little number! Oh, and if you are wondering, the Scripture Saturday challenge is to use any verse of YOUR CHOICE! The next card is really multi-faceted! It is made with wonderful Gina K products, from the lovely FREE digi papers to the super cute little stork stamp! 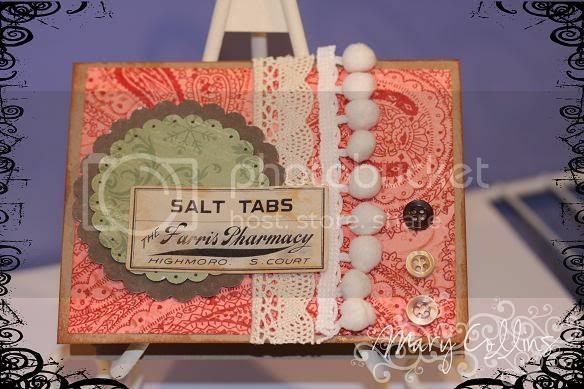 And who could go without using some of my seldom used cuttlebug folders to add pizzazz! 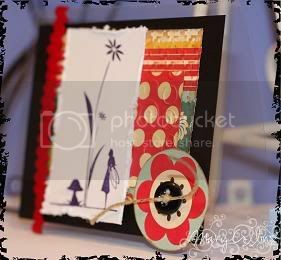 The card also matches the sketch over at 2Sketches4You this week, AND is part of a special CASE Artist Saturday over at Christian Paper Crafts! Welcome! 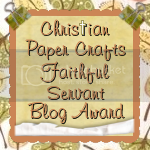 I am so excited you have stopped by my blog on your way through the Christian Paper Crafts blog hop featuring none other than precious Gina K's products! Gina is so generous and loving and we are just thrilled to have her as our sponsor this month! Have you ever checked out her store? If not, let me tell you, boy are you missing something good. 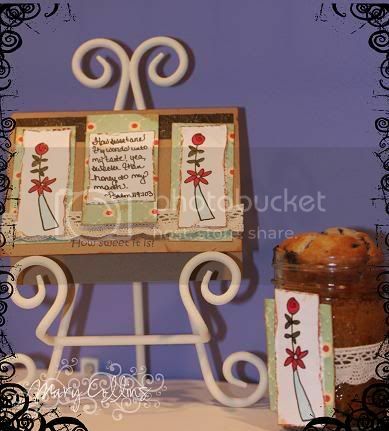 The stamp set I will be showcasing to you from Gina is part of her Stamps for a Cause line - How Sweet It Is! You can check out this wonderful set and all of the details about it, by clicking here. I am over the moon at the fact that this stamp set supports Diabetes! So very close to my heart since my parents are both diabetics and I am a diabetes educator! On with our hop! If you are coming here first, please go to Cindy's blog since she is the beginning of this hop... You should have arrived here from Natalie's blog and head on over to Jen's blog after leaving me! 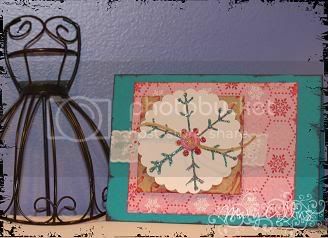 The first item I have to show you today is a little card that I made utilizing the free digi papers that can be found on Gina K's site! 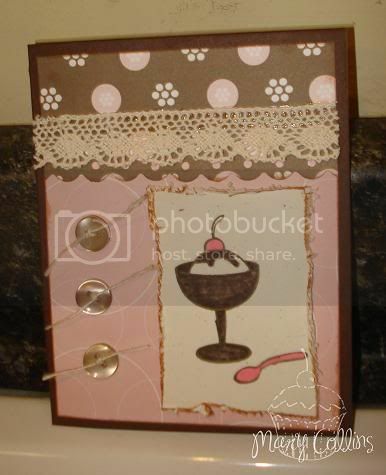 I love the look of these papers, even an ice cream name with Neapolitan :o) I added some buttons from Gina K's store along with the oh so yummy looking ice cream stamp and there you go! My next item for you today is something rather simple, but fun to mass produce and create! Altered pocket tissues! At church, everyone is always looking for a tissue, so what cuter way to share them than to spruce up the packaging and make it look like a sweet Spring treat! These can also be done as affordable small gifts for any holiday, including the upcoming Valentine's Day! I hope you have fun as you are hopping along with us today! Be sure to check out Gina K's store as they just had a new release last night!!! I simply adore the new fabric flowers that are popping up everywhere. I don't however adore the price tag that is on the packaging of them... Being in school and having a family takes away some of the frivilous-ness, but I wouldn't have it any other way! I decided to take a shot at making my own, and I am pretty tickled with it!